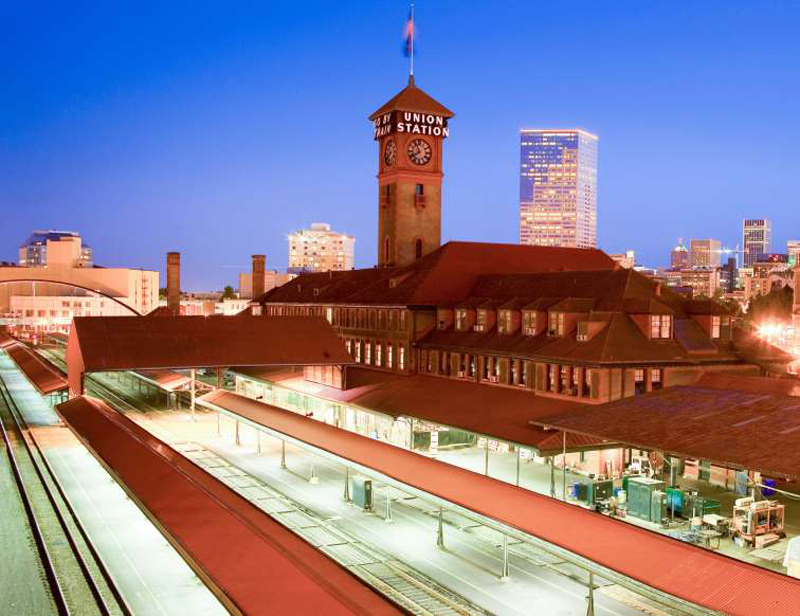 12 Most Beautiful Train Stations in the U.S.
At over a century old, the grande dame of train stations sees 267,000 people crisscross through its main concourse—passing the iconic information booth and four-faced clock—each day. The most striking feature of the Beaux-Arts station, though, is the constellation mural painted across its green arched ceiling. Astrologists beware, not all of the stars are in their rightful place. 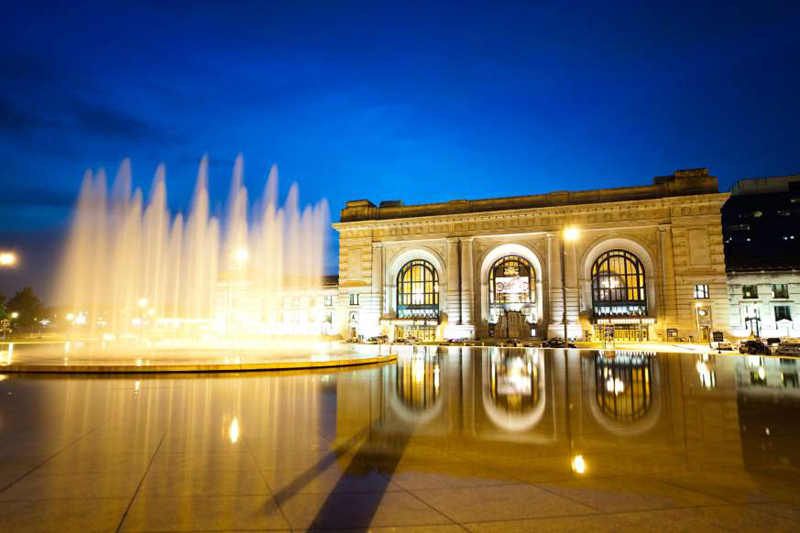 While trains to Chicago, L.A, and St. Louis still run through the working station—built in 1914 and restored to it's Beaux-Arts glory after a prolonged closure in 1999—the real draws here are the more recent additions: a permanent rail history exhibit, a planetarium, science center for kids, and movie theater. Be sure to look up in the main hall to catch a glimpse of the three 3,500-pound chandeliers hanging overhead. 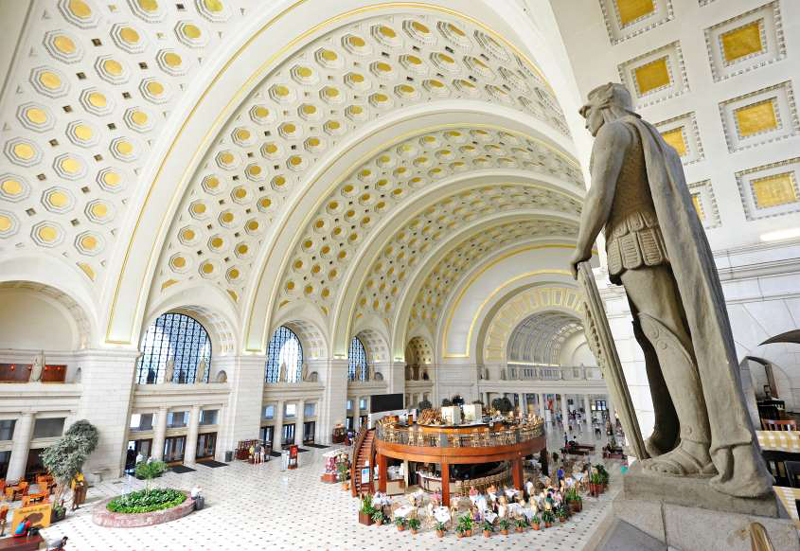 The stunning arched main hall of D.C.'s Union Station is the centerpiece, featuring 22-karat gold leaf decorating the ceiling and 46 statues of Roman soldiers (pictured) that appeared in the original 1908 station, according to Curbed. Besides being a working Amtrak station, the hub attracts visitors to its underground shopping concourse—a whopping 37 million travelers, shoppers, and D.C. natives in all. Everything about the central Cincinnati station screams Art Deco, thanks to two massive relief figures carved in stone on the buildings exterior. While the station still welcomes Amtrak passengers, it's been mostly transformed into the Cincinnati Museum Center—home to the city's history museum, children's museum, and the Museum of Natural History & Science. 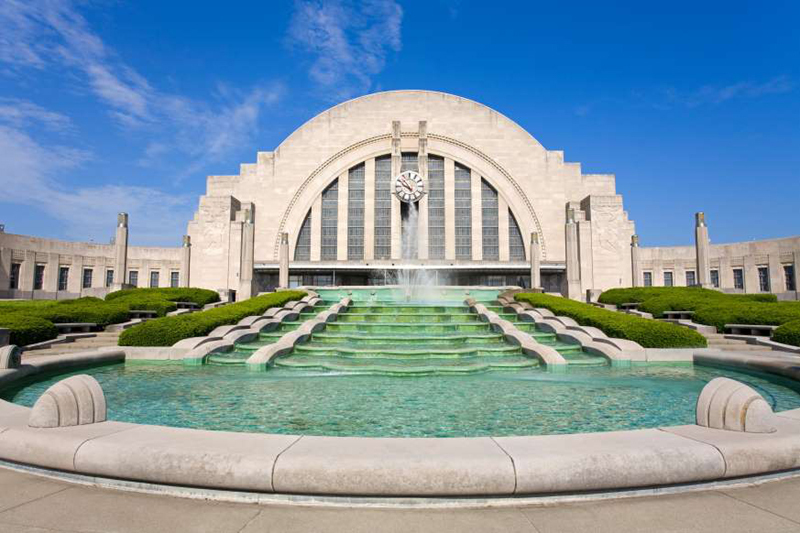 Visitors also head there for a look at Winold Reiss's restored ultra-colorful, enormous rotunda murals, which illustrate the history of the United States, and Cincinnati itself. 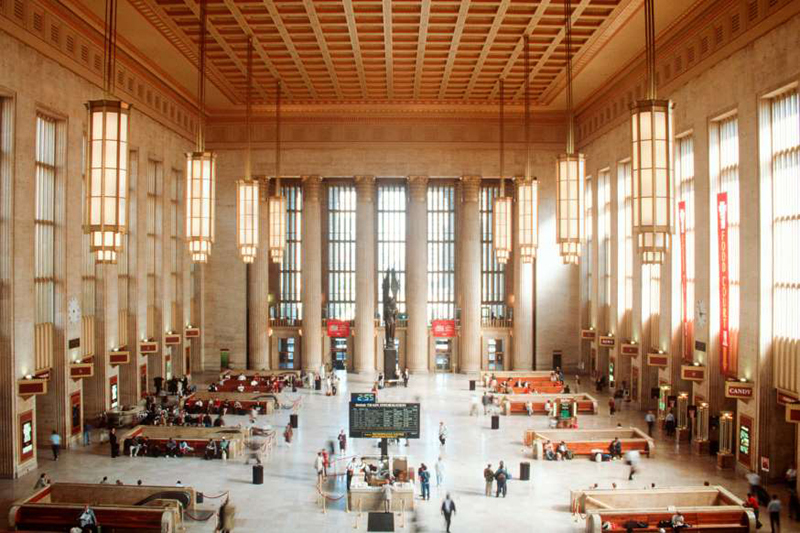 You'll want to spend most of your time in the third busiest station in the country looking up: five-story-tall windows and glamorous Art Deco chandeliers illuminate the interiors. 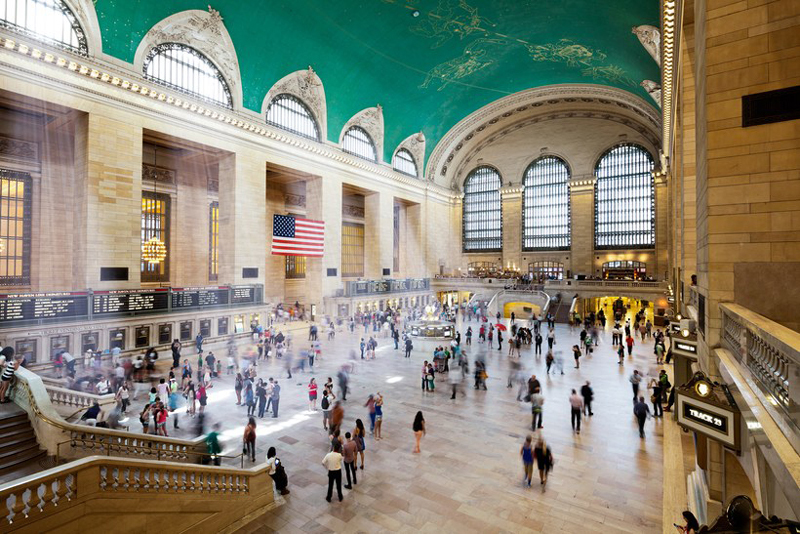 Be sure to schedule time before your train to sit and people watch in the waiting room, which according to Curbed is two football fields long. 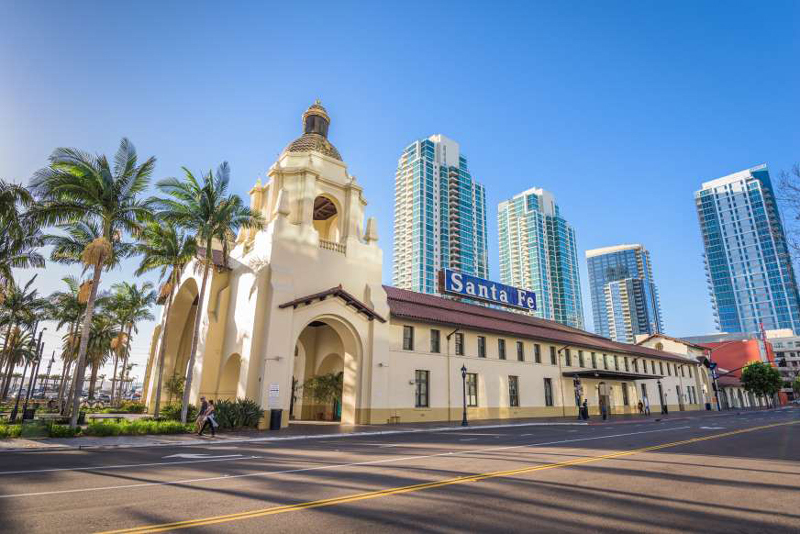 Opened in 1915, the Santa Fe Depot is defined by its Spanish revival style-building reminiscent of 17th-century missions, and the rows of palm trees that line its track. The starting point for Amtrak's coastal Pacific Surfliner ride—ending in San Luis Obispo—the station has an impressive arched ceiling in its cavernous waiting room. 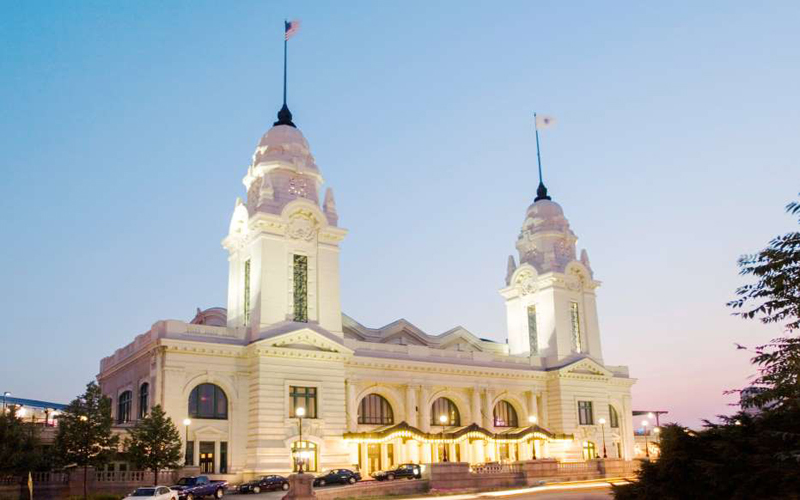 Less than 40 years ago, Worcester's Union Station in central Massachusetts was in complete disrepair, and Amtrak was actually using a separate station to service the area. 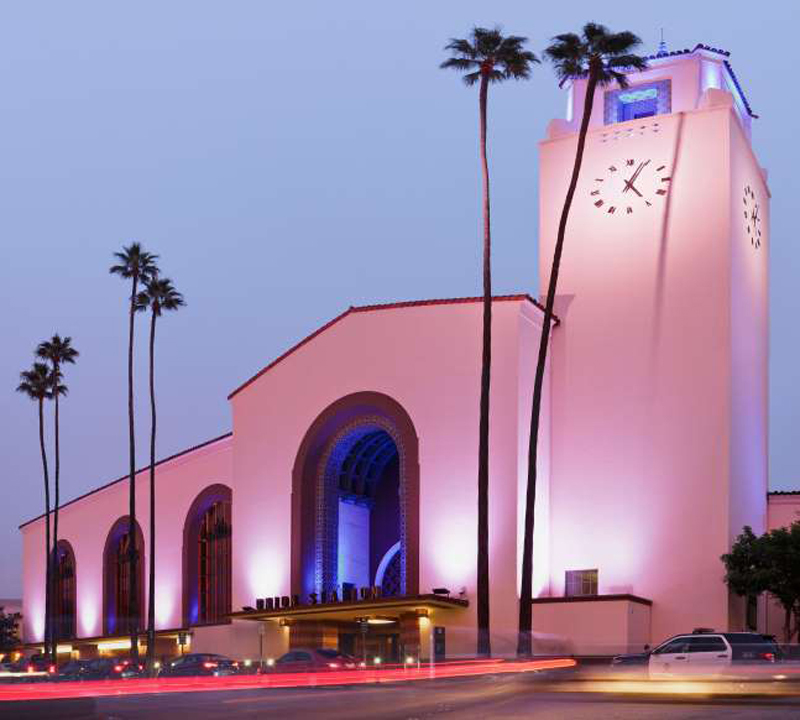 But after a restoration in the late '90s, the station is as good as new, with its 175-foot-tall towers rebuilt and stained glass ceiling and marble floor returned to their former glory. 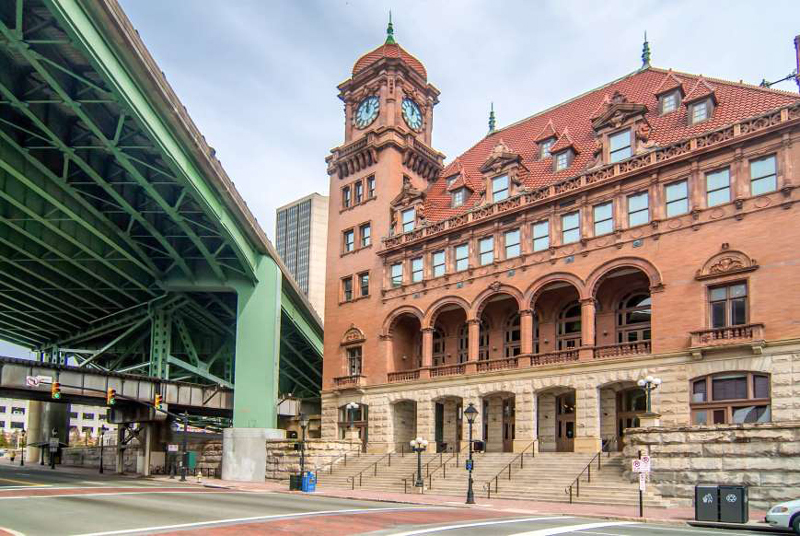 Travelers driving through Richmond will recognize the station's brick six-story clocktower that abuts Interstate 95. 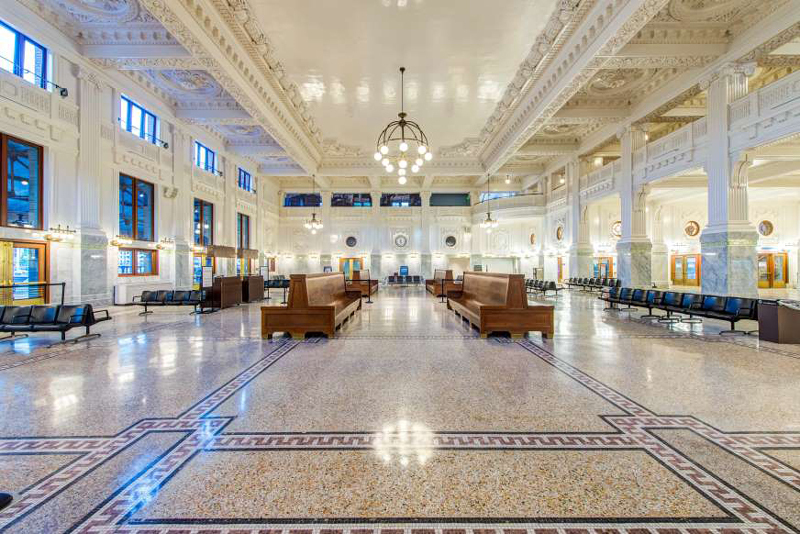 Inside, the fully-restored station mimics the design of the original Victorian-era building—with a peach, green and white paint scheme. It takes a lot to look this good at 123 years old. There have been numerous renovations, starting in 1927, when Italian marble was added to the walls and floors, and later in 1987, with the restoration of the waiting room's detailed floral patterned-ceiling. As for the clock on the station's tower? It still has to be wound every seven days, according to Portland Monthly. 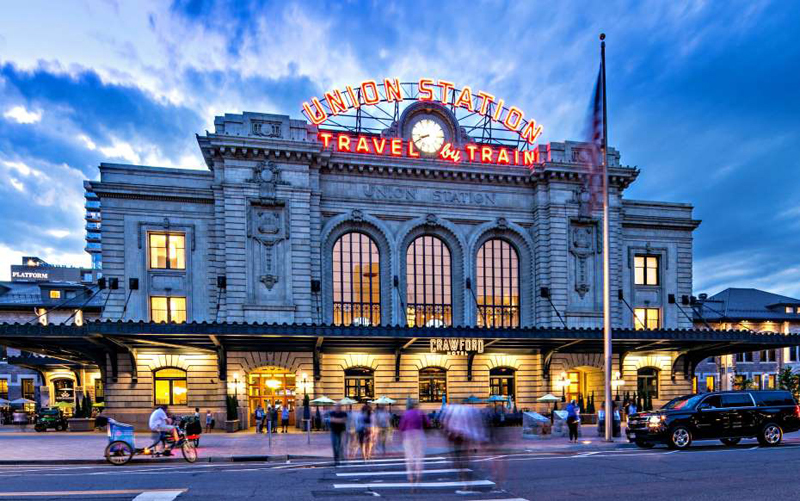 U.S. Daily News: 12 Most Beautiful Train Stations in the U.S.